100-plus plant-based recipes designed to improve overall health and increase vitality - and not make you feel guilty about your current diet. Hansard’s straightforward philosophy – eat more fruits and veggies however and whenever you can – seems doable, thanks to delicious option, such as Mushroom Bolognese Lasagna, Cauliflower Parmesan, and satisfyingly sweet Salted Caramel Bites, made with sticky Medjool dates. Hansard encourages resisting the urge to count calories, too, asserting that eating should be a lifestyle choice, not a diet. “When we think of food as numbers, it zaps the joy that is in a meal,” notes the author, who still succumbs to the occasional Sour Patch Kids and visit to the Taco Bell drive-thru. She does, however, present a strong argument for making better choices as often as possible. Case in point – a side-by-side comparison of her 16-ounce Beginner’s Luck Green Smoothie with an 8.6-ounce soda. Both clock in at 101 calories but the shake contains nearly half the sugar, plus offers generous doses of fiber and vitamins A and C.
Likewise, Simple Green Meals features loads of “Did You Know” nutritional factoids (onions may increase circulation, and jalapenos can rev metabolism) as well as “rawkstar” prep and cooking tips. While not every recipe in the 320-page softcover is vegan or gluten, nut, and dairy free, modifications are generally offered. On the flip side, Hansard has nothing against readers topping dishes like her Sweet Potato Breakfast Hash, featured below, with a fried egg, should they still crave animal protein. Read on for the tasty recipe. 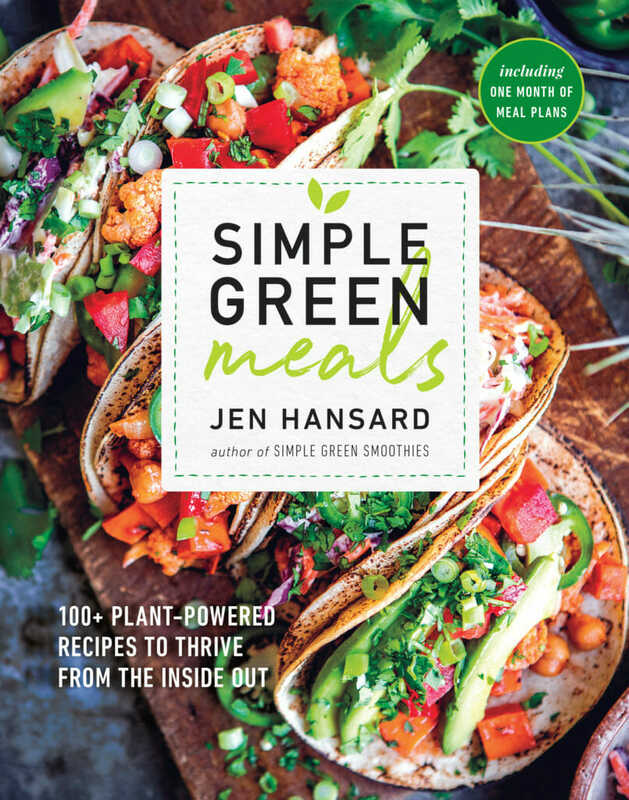 Reprinted from Simple Green Meals. Copyright © 2018 by Jen Hansard. Photographs copyright © 2018 by Lindsey Rose Johnson. Published by Rodale Books, an imprint of the Crown Publishing Group, a division of Penguin Random House LLC. frequently, until the onion starts to soften and turn golden on the edges. frequently, until the sweet potatoes are cooked through. Add the kale and gently turn everything over to mix well. Cook until kale has wilted, 1 to 2 minutes. Adjust seasonings, if needed, adding more salt, black pepper, and cayenne, if using, to taste. Divide between 2 plates and top each plate with a fried egg and a sprinkle of red pepper flakes or hot sauce, if desired.